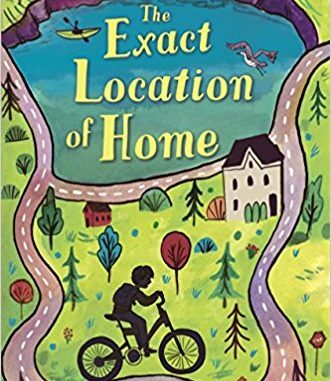 The Exact Location of Home by Kate Messner is about a boy named Kirby Ziglinski, but people call him Zig. The story is about Zig looking for his father. He gets a note saying that his father is coming to visit him but he never shows up. Zig is now determined to find his father. He goes to a garage sale and gets a GPS system. He is very good with technology so he is able to fix it even though it was broken before. Using this GPS device he is able to go geocaching. While looking on the website for the geocache, he sees a user named Senior Searcher. Zig is convinced that this is his dad. Back when Zig was a little boy and his parents were still together, Zig and his father went geocaching. Now knowing that his father could be using the username Senior Searcher, he becomes determined to track down his father. “Where Dumbledore’s Apprentice had uploaded a photograph of himself, Dad’s profile shows a big, stupid-looking cartoon bug that says ‘No Image Selected’ underneath. Where Dumbledore’s apprentice had a link to his email address, Dad’s contact information is listed as unavailable” (55). Since there is no information on the Senior Searcher, Zig decides to do it the hard way. He will go to all the geocaches that Senior Searcher has been to, to find any clues that his dad could have left him. Some of these boxes are hard to get to including going into a cave full of bats, crossing a river and walking on the railroad tracks. Zig and his mom are going through a hard financial phase. Zig’s dad has stopped sending them money and Zig’s mom is in nursing school as well as working as a waitress at the diner. Zig and his mom get kicked out of their apartment and have to move in with Aunt Beka, who also kicks them out once Uncle Richard comes home from a business trip. Zig and his mom then move into a homeless shelter at the church. “I look over at mom and catch her staring at the Community Hospitality Center sign on the door like she’s thinking the same thing. This is a place for the poor. The unfortunate. The homeless” (129). Zig is very upset and scared but eventually gets used to his new home. There is a conflict between Zig and his mom because he doesn’t understand why his mom hasn’t called his dad and asked for help. Zig has a hard time at school. He used to always do his homework and was a good student, but now that he got kicked out of his house and all his structure is gone, he has a hard time. He gets in-school suspension because he throws a chestnut at the school sign and the principal sees it. This is just the start of Zig miss behaving. He runs away from school and skips class. Zig also isn’t happy that he has to go to the morning program at school. This is for families that can’t afford breakfast. The kids are allowed to go to school early and eat in the cafeteria. Zig doesn’t like going because he doesn’t want his friends, Ruby and Gianna, knowing his situation. There is a conflict going on between Ruby and Zig because they like each other but are both to scared to do anything about it. There are a couple major themes within the book. One of the themes is that everything will work out in the end. “The great thing about a parallel circuit is how things work out, even when something goes wrong…You could have five bulbs burn out and because of the way it is all wired up, there’s still a path for the electrons to travel. They find their way. If there’s a roadblock, they find another way” (239). This supports the theme through a metaphor. Since Zig is all about technology, he is thinking this through in his head and hoping that everything in his life will all work out in the end. An important lesson that is taught by the book is that home doesn’t have to be your house that you grew up in throughout your childhood. Throughout the book, Zig changes his idea of home to where family is and finds himself calling the homeless shelter home at one point. At the end of the story, he moves in with Mr.Webster and learns to call his house home as well. “ ‘Mom had to work, so I’m swinging by the diner before I go back to the Webster’s’ place.’ ‘Back home,’ Gianna corrects me. I smile. Mr.Webster keeps saying that too. I guess it is home. Its starting to feel like it” (249).The concept that home can be anywhere as long as your family is there and the theme to not give up hope and everything will work out in the end is shown in the book, The Exact Location of Home. Whether that be a missing parent, trouble at school with friends or bullies or even being evicted from your house, these things do happen to kids. This book is realistic fiction. I think that the genre has to do with the authors intent of writing the book. Zig is just a young boy in middle school going through these rough patches. I think that middle schoolers in real life also have these changes. Whether that be a missing parent, trouble at school with friends or bullies or even being evicted from your house, these things do happen to kids. Zig makes it through in the end, so if a student reads the book, they might feel a little better about their life. They can also relate to the character and feel like they are not the only one going through these hard times. I think the book was written really well. Even though it was meant for a younger reader than myself, it still kept my attention and it was hard to put it down. I think that is a huge success for a book. You want people to be intrigued by your book. In addition, I think the themes are good and not common cliche themes. I think they send a good message and are easy to understand. The author also portrays the themes in a clever way. Having a background story of Zig finding the geocaches is great but it also walks you through the hardships that he is having. The way Kate Messner writes the book also makes it easy to follow. The chapters are short which serve for good stopping points. In addition, the titles of the chapters foreshadows what is going to happen in that chapter. For example, chapter 4 is called “Sirens and Lights.” This means that the cops or a rescue vehicle might be involved with this chapter. It puts the reader on the edge of their seats because they don’t know who is in trouble or what is going on. When I was reading the book it reminded me of the book Paper Towns by John Green. In that book a boy is searching for his friend that is leaving clues behind for him. He follows the clues and in the end finds who he is looking for. Zig follows the geocaches and pieces together the little souvenirs that are left behind at each geocache. Zig might or might not find who he is looking for, I do not want to spoil it for you. Overall, I think that The Exact Location of Home was a good book. It was the right length and the reader could really relate to Zig and what he was going through. Olivia Farney is a junior at Clayton A. Bouton High School.